The model was stitched on 28 count opalescent Lugana fabric, a ‘solo’ piece from Silkweaver Fabrics. Finished block is 41 x 41 stitches in size. 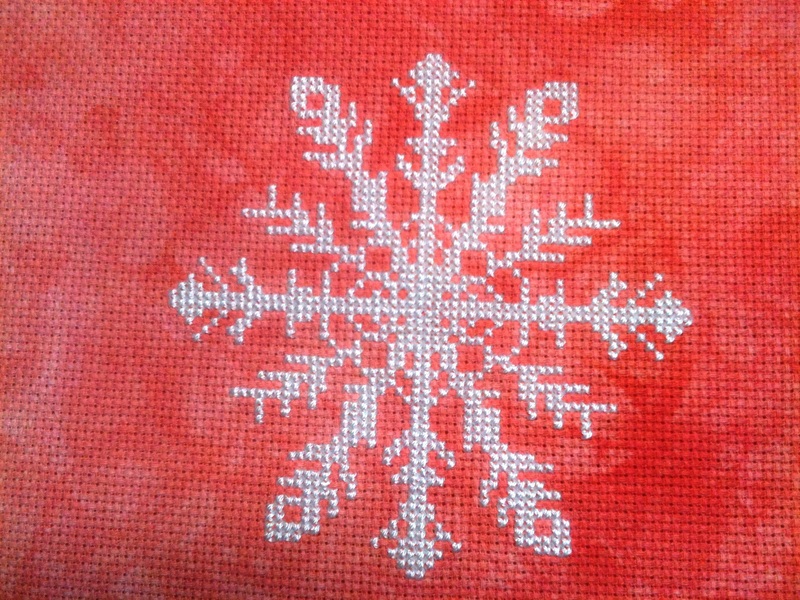 While I do include a floss key for the colors I used to stitch the piece, I do encourage you to choose your own colors to match your holiday decor or to suit the cross stitched ornament gift that you’re creating for someone. Have fun with it, use up some leftovers from your stash, or pull out those hand dyed threads you’ve been ‘saving for later’ to try out. Whatever colors you decide on, I look forward to seeing your finished ornament. 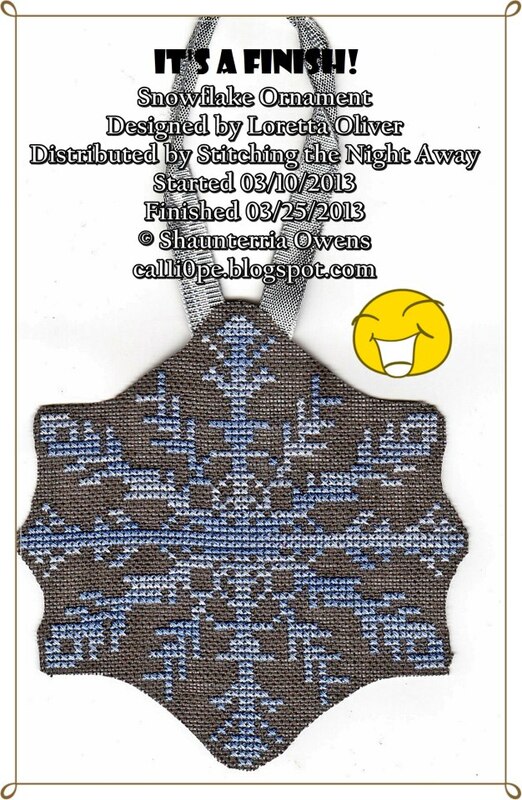 I hope you’ll come by and share a photo with me in the Stitching the Night Away Facebook group, use hashtag #stitchingthenightaway and/or tag me @retta719 on Instagram, or even email me directly. Step 1: Wash and prepare your stitched piece. Select your backing fabric, trim, cord, ribbon, hanger, and or tassels to compliment your ornament. Step 2: Measure your ornament and decide how much larger than your stitching you want the finished ornament to be than your stitching. I like to stay within 1/4 inch to 1/2 inch of the edge of the stitching. Mark out the size on two pieces of mat board, and cut them. I like to use my mat cutter, but an Xacto knife and a ruler will do as well. Tip : Some framing shops will sell or give away scraps of mat board. Step 3: Cut out two pieces of 1/4 inch foam slightly larger than the pieces of mat board. Step 4: Cover your work surface with a cheap plastic tablecloth or garbage bags. Spray the back of your mat board with an aerosol glue. Step 5: Place the mat board on the foam glued side down. Press firmly. Trim away excess foam. Step 6: Center stitching over foam-covered mat board. Step 7: Turn stitching and foam-covered mat board face down. Make sure your fabric doesn’t shift so that you keep the stitching centered. Step 8: Trim excess fabric. Step 9: Trim on all sides, I also like to cut away the corners – its less fabric to have bunched up on the back later on. Step 10: Using a hot glue gun start adhering stitching to mat board. Apply glue in sections to back of mat board. Do not apply glue to all sides at once (hot glue dries quickly). Tip : If you like a nice rounded, pillow-like front, put pressure on the edge of the mat board with one hand as you pull the fabric to the back with the other hand. Step 11: Glue down all sides of stitching. Tip: If you mess up or the ornament ends up not centered properly, use a hair dryer on the hot setting. This will allow you to pull off your stitching with little trouble. When this happens I remove all dried glue before I try again. Step 12: You now have your stitching glued to one piece of mat board/foam. Step 13: Cut a piece of your backing fabric. Step 14: Make sure you cut your fabric larger than your foam-covered mat board. You want enough fabric that you can pull it over to the back. Step 15: If needed, press your fabric. Step 16: Glue backing fabric to foam-covered mat board with hot glue (same as you did with your stitched ornament). Step 17: You now have two ornament “half” pieces ~~ one is your stitched ornament, the other your coordinating fabric back. Step 18: Spread a thin coat of white glue (I use Aleene’s Tacky Glue) that will dry clear on the back of both pieces. Do not use too much glue, or it’ll ooze out of the sides. If you do not intend to make your hanger out of cord or ribbon later, or add a tassel, do it now on one of the glued halfs. Make sure to center your hanger and/or tassel. Step 19: Sandwich the two pieces together (glued sides touching each other). Step 20: Tightly wrap the sandwich with plastic wrap and place clothespins all around the edges (the more the better in my opinion). Leave the ornament like this for two hours. Step 21: After two hours, remove clothespins and plastic wrap. Where the two halves of the ornament meet, run a thin bead of white glue. I like to do this in small sections. Step 22: To hide where the two halves of the ornament meet, “hide” it with cord. Place the cord where you’ve just run the bead of white glue. Step 23: A hanger can be made out of a loop of cord as you’re running it around the edges. I re-enforce my loop with a pin pushed through the cord and into the ornament’s foam. Step 24: Before cutting the cord make sure you wrap the cord where you plan to cut it with clear tape. This will stop the cord from un-ravelling later on! Tip: Use only a clear tape, don’t use a magic tape or a frosted tape, it is very obvious even from a distance. Step 25: Cut the cord where you wrapped it in tape. Step 26: Glue down the last bit of cord, making sure it meets up with your starting point. 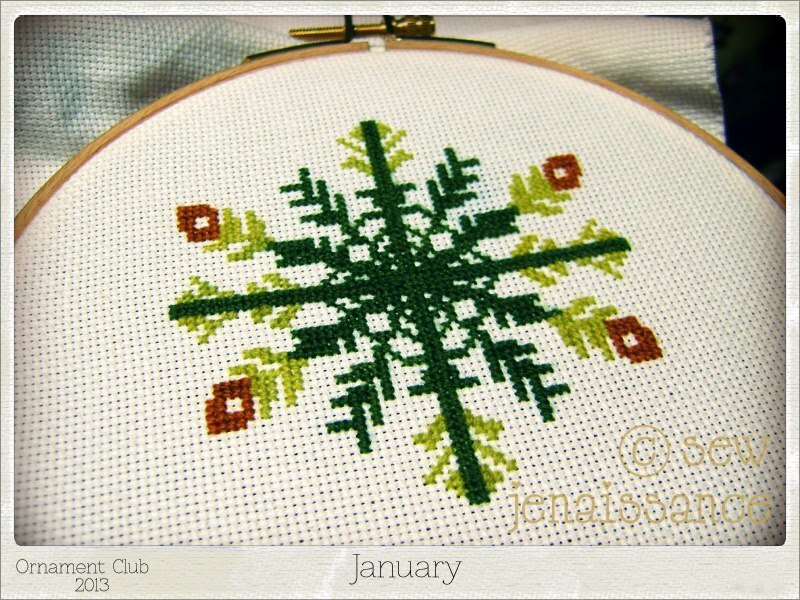 Last week’s chart of the week was also a Janlynn ornament set. I decided not to buy the owl ornaments when I saw these cute hot cocoa mug ornaments! Hot chocolate is kind of a big deal around here. The kids love hot chocolate nights, they get excited about it and they take it pretty darn seriously. They get festive and stir it up with candy canes, they look for flavor options like mint and white chocolate, they love flavored marshmallows, and sometimes we get adventurous and make homemade marshmallows just for hot chocolate. if we’re out shopping and I stop into Starbucks they want their hot chocolate in a red cup, and they savor every sip. Thanks to Amazon Prime, my ornament kit should be here tomorrow! Yay 🙂 Since chunks of my stash are still in a box from moving, I’ll be working on these over the holiday break. – Side note; if the cocoa mugs are showing out of stock when you get to the page, wait a few hours and go back. They were out of stock when I first found them and they were back in stock by the end of the day! Stitch a big fluffy snowflake! 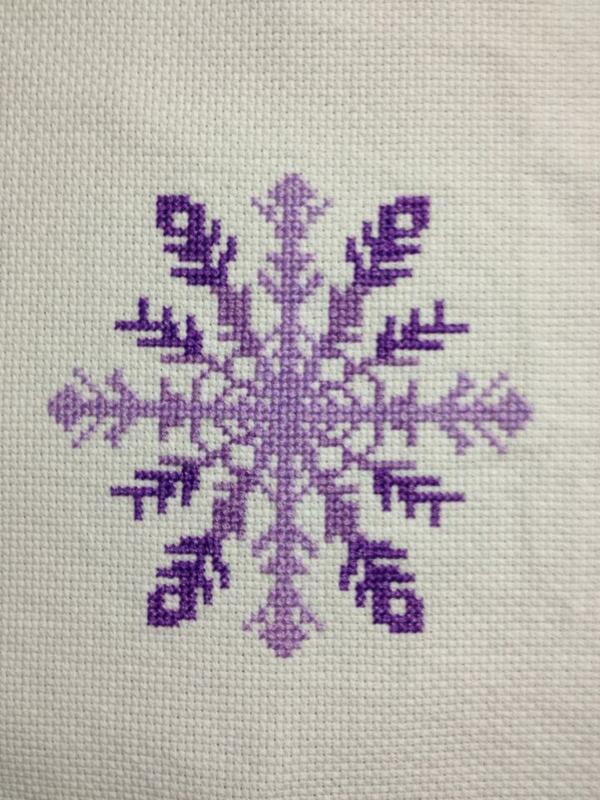 Can be stitched as an ornament or any other winter themed project you want to stitch up. 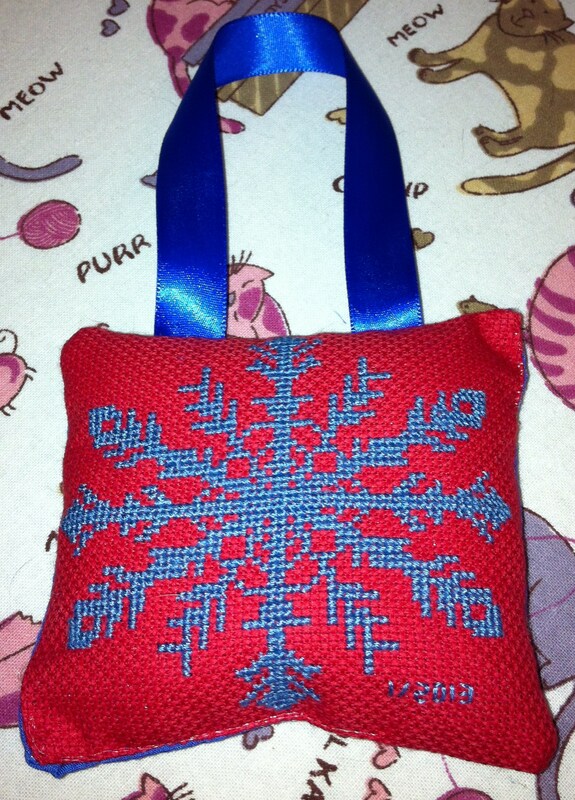 Well, Laurel finished stitching the ornament before even I did. She used Earthen by Picture this Plus Fabric and stitched the design in Gentle Arts Sampler Threads. I was happy to see this picture land in my inbox this week. I need to catch up with her and get my stitching finished too! I love this fabric ~ just gorgeous! 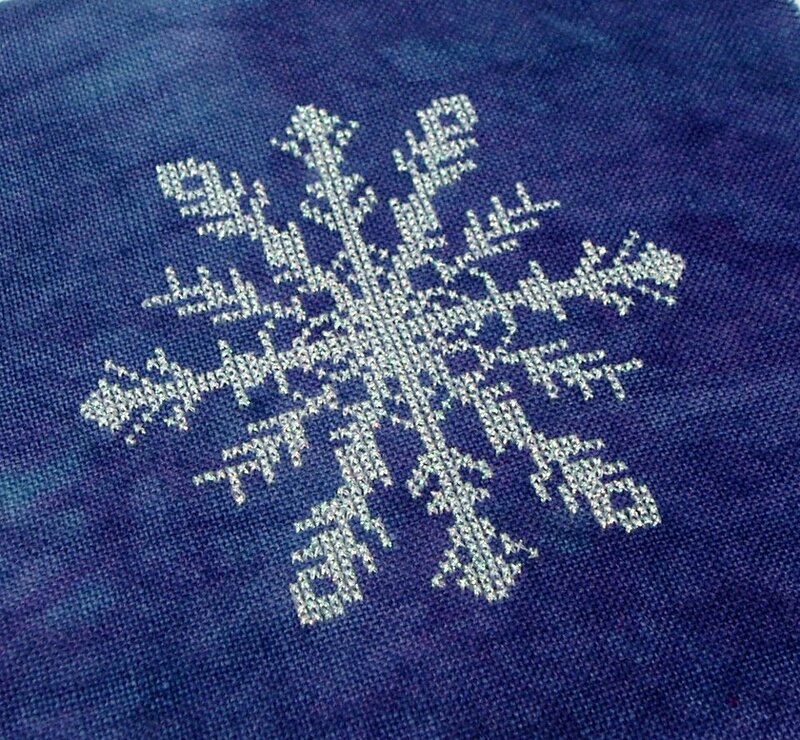 Laurel stitched her snowflake on 16 count Twilight by Picture This Plus using DMC Pearlesent Effects E5200. Laurel also recently stitched the first pattern from the club, you can see that finish here. And she was also recently featured in the community section here. Ornament Club Pattern Stitched by Katherine B.
Katherine made a few changes when she stitched her ornament and was kind enough to share her work with me. to cross stitch is simply stunning! Whether you hang them on the tree or display them as a more focal point on a table, shelf or mantle, they are sure to attract a lot of attention.